Like many other boom towns, Edmonton has a reputation for practical but boring architecture. Maybe that’s why so many homeowners have been working unique contemporary design concepts into their home exteriors over the past few years! Here are four of the most common contemporary design trends in Edmonton and what you need to know about each of them. You’ve seen architectural panels before, but you might not have known what you were looking at! Many of the newer condo buildings and commercial units in shopping centers feature panel accents. Usually these panels feature hidden fasteners and channels, giving them a clean and uniform look. Pricing on these panels can vary quite a bit depending on materials and design. Some of the panels used on condo projects can cost over $50 per square foot to supply and install. For a standard 3 bedroom bungalow in Edmonton, you could pay over $60,000! Over the past five to ten years, some manufacturers have taken advantage of the demand for high priced architectural panels and have come out with lower cost alternatives. They are less expensive to manufacture and easier to install, but still feature the same design elements of hidden fasteners and clean, uniform lines. With a few tricks and substitutions, you could clad your home with contemporary architectural panels for about half the cost of the traditional stuff. One option that you’ll see much more often in contemporary residential design is acrylic stucco. Acrylic stucco will generally save you quite a bit compared to the metal panel pricing above. At Blue Jay Exterior Renovations we do not provide stucco installation, but you should expect to pay somewhere between $9 to $14 per square foot. One of the nice things about using stucco in your contemporary design is that it can sometimes save you money compared to traditional stucco design. Most traditional stucco designs in Edmonton use decorative trims around doors and windows, while a modern design typically has very few details for a flat, contemporary finish. This can reduce the labour costs you pay to the applicator, which saves you money! Every product has its pros and cons, and stucco is no exception. One of the downsides of acrylic stucco is that the performance of the end product varies drastically from contractor to contractor. Most siding products are manufactured and painted in a factory, while stucco is mixed on site by the applicator. Some disreputable stucco contractors have been known to mix the stucco on the thin side, meaning they use too much water in the mix to save money, or skip that extra coat altogether! This is why you see major differences in the long term performance of stucco on homes and projects around Edmonton. If you’re looking for referrals to stucco contractors in the Edmonton area, please feel free to contact me! I would be happy to put you in touch with one of my contacts in the stucco industry to help make sure your project turns out perfectly, no matter what product you decide is right for your home. The use of Hardie Panel and third party aluminum trims has exploded over the past five years in Edmonton. The fiber cement panel product has traditionally been used in a board and batten application in gables. However, the adoption of smooth Hardie Panel by designers as a contemporary option has really shifted the way the product is used. 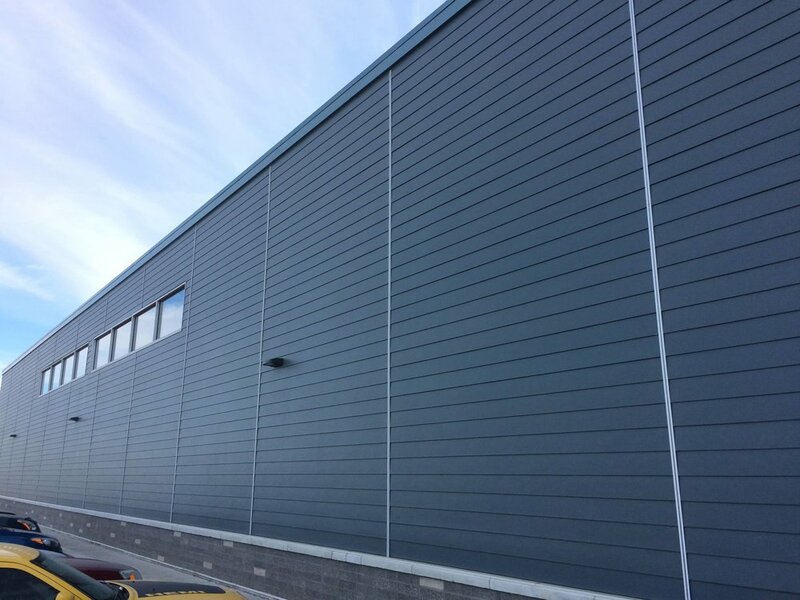 By using extruded aluminum trims around the joints of a smooth Hardie Panel, you can have a look similar to metal panels at a fraction of the cost. There are a few compromises that come with that cost savings though, the most notable being visible screws or nails. Unlike metal panels, Hardie Panel must be face fastened by screw or nail. This means that from five feet away, you will be able to see fasteners throughout the panel, giving up some of the clean look of a metal panel. However, there are options for reducing or showcasing the appearance of fasteners depending on the look you want to achieve. For a really funky look, try stainless steel screws with Iron Gray HardiePanel! If you're interested in seeing some pictures, let me know and we can review some options. While there are a few manufacturers that make aluminum trims to pair with Hardie Panels, Easy Trim is my strong recommendation for the Alberta market. Easy Trim is based in Alberta and features several innovations that its competitors haven't developed - meaning a cleaner look and better installation on your home. Pricing on Hardie Panel and Easy Trim can vary depending on the design. I've seen it range from as low as $10 per square foot all the way up to $25 in Edmonton. If you're interested in learning more about the factors that influence installation cost, check out my blog post on reducing labor costs or contact me to discuss directly. If you're looking for a contemporary design on a budget, Hardie Panel with Easy Trim reveals is a fantastic and unique option. You get the same durability and warranty you’d expect from James Hardie Building Products, but a completely different design. For a modern and unique option for siding in Edmonton, pair Hardie Plank lap siding with Easy Trim's matching aluminum reveals to create a contemporary design. Using James Hardie lap siding with Easy Trim reveals is the perfect option for people who want a slightly more contemporary design but aren’t quite ready to commit all the way to the architectural panel design style, and the cost difference is much less than some of the other options in this article. Hardie Plank and Easy Trim will likely cost you about the same as a standard Hardie Plank project using Hardie Trim: about $8 to $12 per square foot depending on your design. This system is starting to show up on commercial projects in Edmonton, but hasn't been used much in residential renovation or infill yet. Given the look of the finished product and bang for your buck, I think this is the trend that will pick up the most steam in Edmonton over the next 5 to 10 years. If you're interested in learning more about any of these products, I'd love to hear from you. If you would like to see more photos, get product samples, or addresses of local projects, get in touch and I'll gladly help you find answers to your questions!